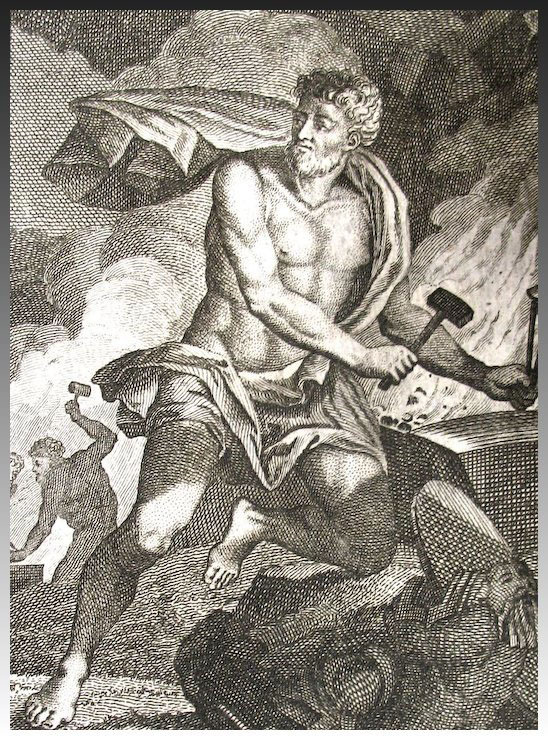 The eldest of the eight first gods, Elucidor is generally recognized by the other gods as the final authority. He wields much power and holds the Gods’ court from the Halls of Light. The Gods are supposed to abide by a set of rules but, as far as they know, their trespasses go unheeded. Elucidor believes that there is a higher purpose than even the Gods, and he is charged with enforcing the rules because of this. He has a harder time with the evil and chaotic gods — as expected — but he generally uses his superior powers to keep even the most diehard rule-breakers in line. It is his belief in a power higher than the Gods that has created the Enighyll (EN-eeg-uhl) … those who believe in one God. They respect Illucidor but do not worship him. Maker of all things magical and wondrous, Hadan is the chief architect for the gods. His building may take place on any plane, and he can create anything — from a simple tool (albeit magical) to the most intricate marvel. He is only limited by the technology of the being(s) he is creating for as he may never create for himself. Other gods always are asking him for special equipment for their emissaries. He lives alone in a deep cave somewhere on Yalarad. He is the divine representative of smiths, of course, but he also represents architects, masons, framers, and all others who work to create structures in the world. Athena being used to represent Dou who would be shown with a bow and more weapons… and maybe a tankard of ale. Not a god of careful foresight, Dou is the most active of the “good” gods on the PM, she will take a ploy into her head and then there is no stopping her — she will take off until the deed is done. It is better that PM beings do not interfere with her schemes as they usually do not harm anyone and she can be very single-minded when she wants. She also takes to visiting the prime material plane in the guise of a young woman Elf or Human Ranger with leather armour and a bow. She is often hunting some foul demon in this guise. An activity that bothers Illucidor as unnecessary but essentially harmless. Haste is not Dou’s mate’s failure — rather lack of it is. Thot will ponder a question until it works itself out, then he will ponder the reasons and consequences of that action or another to do with the problem at hand. In other words, the two compliment one another very well. Dou keeps Thot moving and Thot keeps Dou from killing all of the PM inhabitants in some fool plot of hers. Writer of poems and bittersweet plays, Uran is the most loyal of the Gods to the “leader”, Elucidor. He lampoons other Gods and major PM figures in his plays — but never Elucidor himself. Only the highest level clerics or God’s emissaries ever get to witness these plays, and if they do they usually believe they’ve had some sort of meaningful vision when really they were simply exposed to the Gods’ version of a soap opera. Turak hates all things living and does much to alleviate his feelings. He never goes to the PM himself as he has been cursed by Elucidor to be mortal there — it is feasible that some lucky adventurer could kill him (oh joy). For this reason he keeps a low profile. He commands the Drow in the underworld and is the force behind the Portal of the Dark Ones. He did not create the Mind Gems, however. Weaver of destinies for all men (that means all races), Mleou does the typical weaving of the tapestry shtick. It is said that she weaves the very soil and rock on which all the peoples of Yalarad live. From Fahn comes the discipline of controlling the magical manna. She spends much of her time studying and experimenting with the forces of nature and magic, thus trying to extend the power of her worshippers, and herself in the process. On Yalarad she is failing miserably — the forces of magic are much more accessible than the forces of nature. The reason is that Yalarad (the planet) is sentient and has the power to direct how different reactions work. Even gunpowder will not function near Yalarad. Some alchemical reactions will function but only the ones that Yalarad knows will not hurt her — she would never tolerate nuclear knowledge. Several high-ranking MU’s have disappeared after toying with leads in this direction from Fahn.